Pimlico Plumbers – the saga continues! 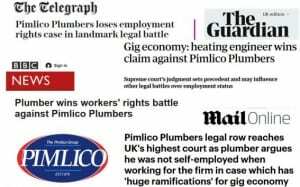 Despite succeeding at the Supreme Court in a key part of his claim, it was announced last week that Gary Smith’s claim against Pimlico Plumbers for holiday pay had been dismissed by an Employment Tribunal. As we previously reported, Mr Smith had argued that despite being treated as self-employed during his six years of working for Pimlico Plumbers, he had actually been a ‘worker’ and therefore should have received holiday pay. The case was seen by some as being a landmark decision in relation to the gig economy. The reason why his claim was dismissed is because of time limits. The usual time limit for bringing a claim to the Tribunal is three months less one day (this can be extended in some circumstances, such as for early conciliation). The Employment Tribunal found that in order to succeed, Mr Smith would have had to bring a claim for each lot of holiday pay within 3 months (less one day) of each period of holiday. The issue turns on whether the holiday pay is part of a ‘series of deductions’ (in which case the claim would need to be brought within the last 3 months of the last non-payment of holiday pay) or whether they are individual deductions which therefore have their own individual time limit. The Tribunal obviously have concluded the latter, but it isn’t clear why they haven’t followed the decision in the case of King v Sash Windows, which we covered here. Mr Smith’s solicitors have said that they intend to appeal the decision, arguing that as it was not made clear to him that he had these rights, he could not be expected to enforce them. He is therefore continuing with the case, which has been going since 2011 and has no sign of ending any time soon! We will of course update you on any further developments as the case proceeds.